Pineapples are all over the place these days. They're trendy now, and during colonial times, the pineapple symbolized the warmest welcome you could extend to a guest. It has continued to evoke a sense of hospitality and sweet goodness throughout the generations. 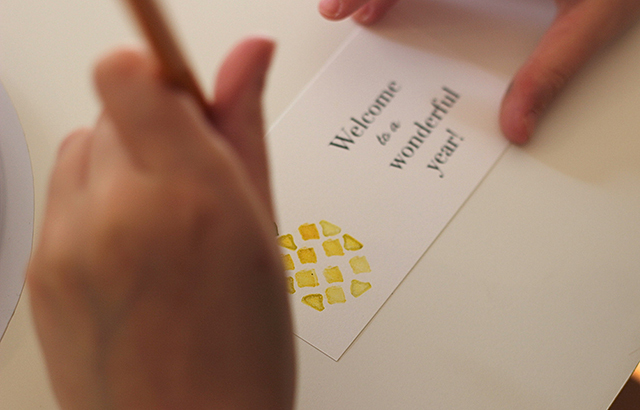 Extending welcome is a primary job for a teacher in the first month of the school. 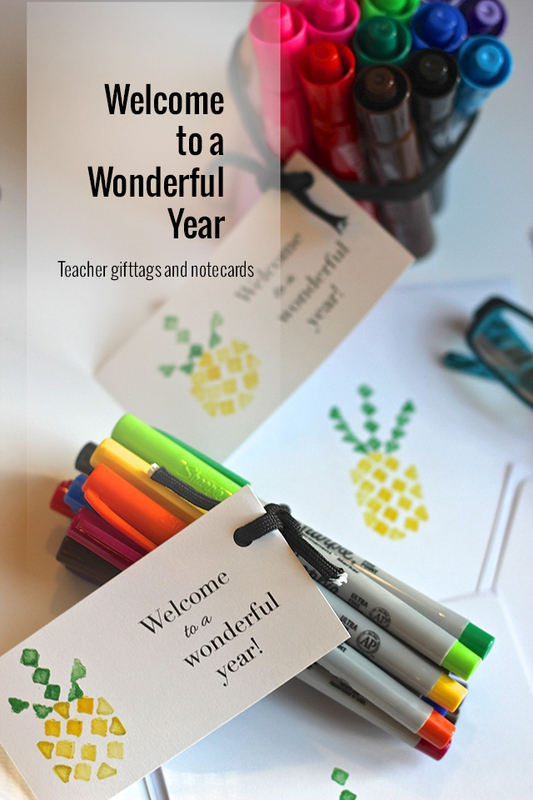 Around here, we're already in the third week of school, and the newness is beginning to wear off...which means... it's the perfect time to give your children's teachers a present that they want. Sharpies! Smelly markers! Window markers! Great pens! The list of fantastic school supplies is a long one. 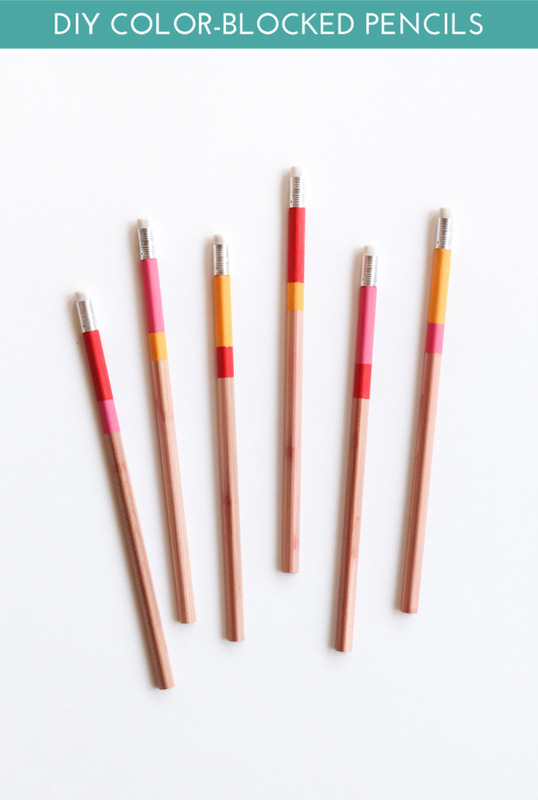 Children aren't the only ones who love these colorful tools. 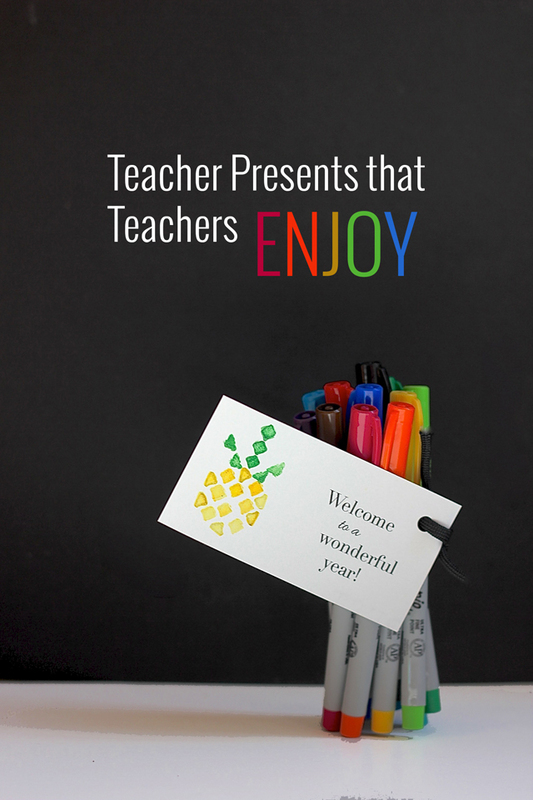 Show the teachers in your life that you look forward to what the next months hold with a Welcome to a Wonderful Year present. 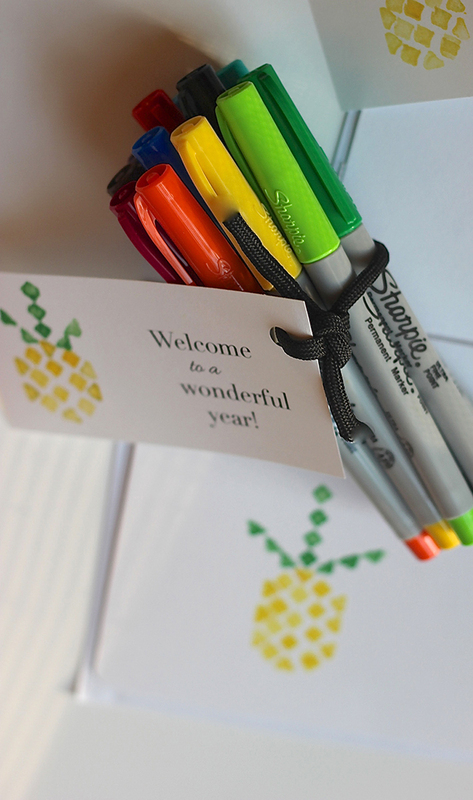 You and/or your children can create these gift tags or notecards using pencil erasers and stamping pads. We bought fun school supplies at Office Max. Right now, you can save $5 off your purchase of $20 or more on select Newell Rubbermaid brands which include all of our favorites (PaperMate, Expo Neon Window Markers, Sharpie, Uni-Ball, & Mr. Sketch) And, you can cash in on Office Depot Rewards for shopping at Office Max as they are owned by the same company! It's kind of hard to resist...Head over to your Office Max or Office Depot and take advantage of the deal while supplies last. 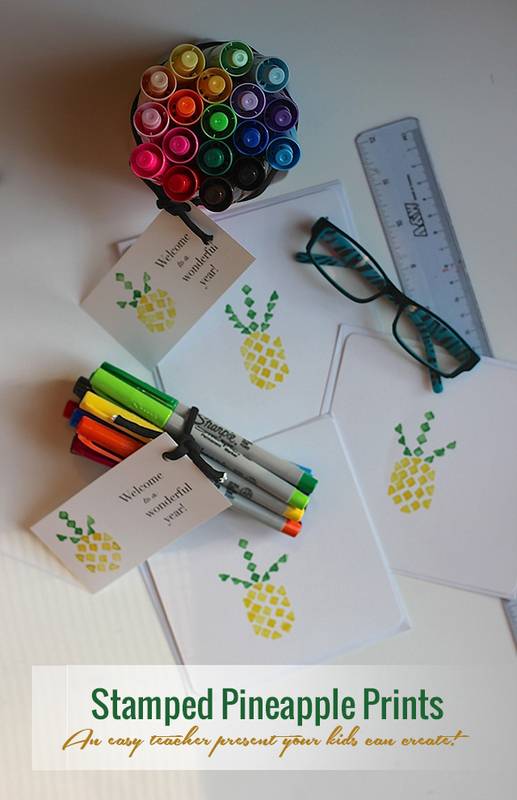 You'll need some pencils with fresh erasers, an inkpad, and some paper to make these pineapple prints. 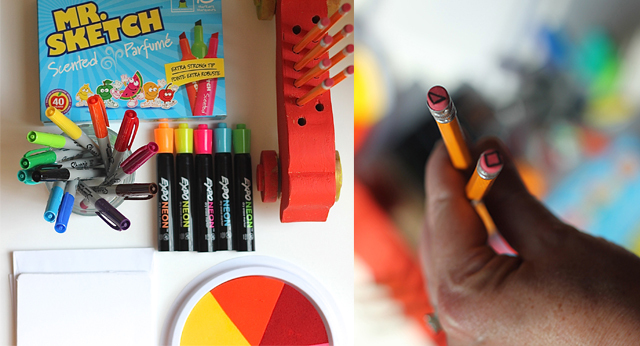 Draw simple shapes on your erasers, like the ones shown above. With an X-acto knife, cut around these shapes. We made two sets of these shapes so that one of each could go into the yellow and green. The pineapple shape is a breeze once you get the hang of it. Using a combination of diamonds and triangles, you can create a charming geometric design. 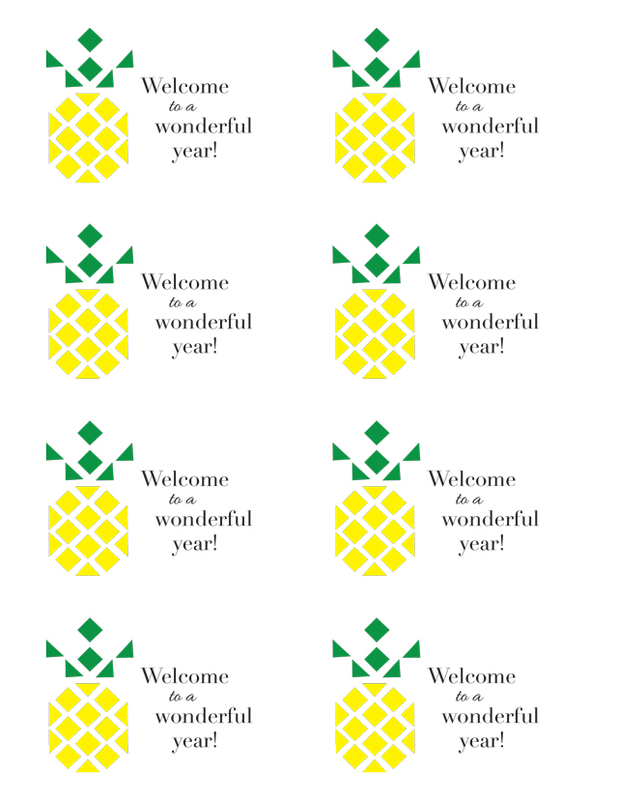 Or, if you aren't ready to take the project right now, click here to download your own pineapple printables. 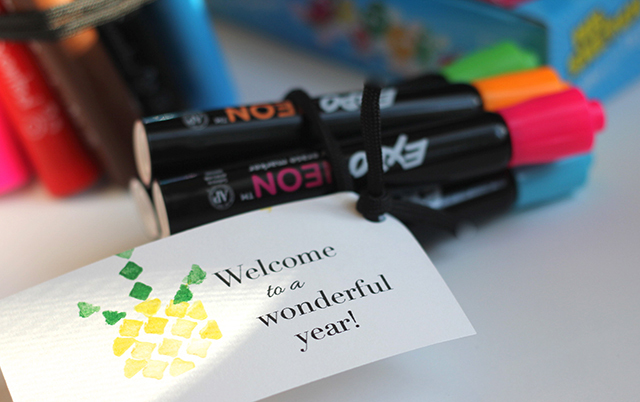 Wrapping up a bundle of these fun supplies with a parachute cord or ribbon and a tag, lets our teachers know that we appreciate them, and we're looking forward to working together!